What Makes Jane Austen Relevant to Modern Society? Where is My Captain Wentworth? We all judge books by their covers, it is how we begin to understand what the text inside may be about. The paratexts we’ve come to learn as readers shape our interpretation of the text before the reading even begins. This book is not fill of pictures or large print text, rather it is printed in full. Therefore, we know this specific edition is not for children. 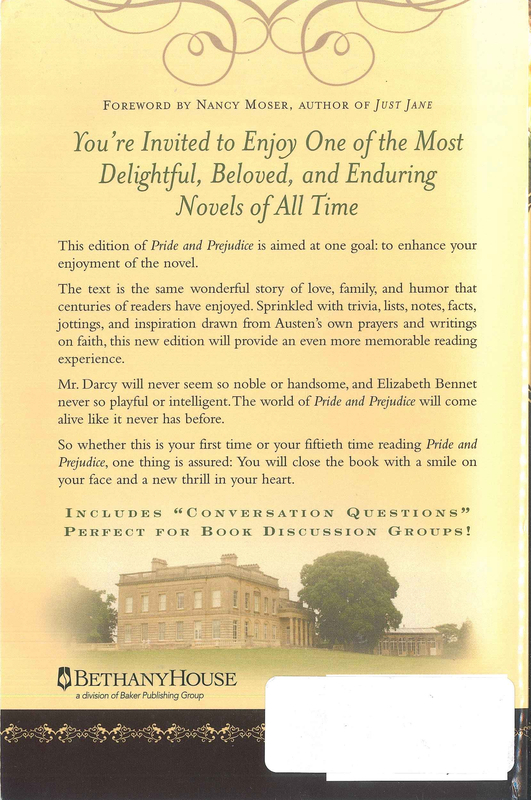 Based on the paratexts of the cover, this edition of Pride and Prejudice is a romance meant for teens and young adults or a book club. Austen, Jane. Pride and Prejudice. Insight Edition ed., Bethany House, 2007. 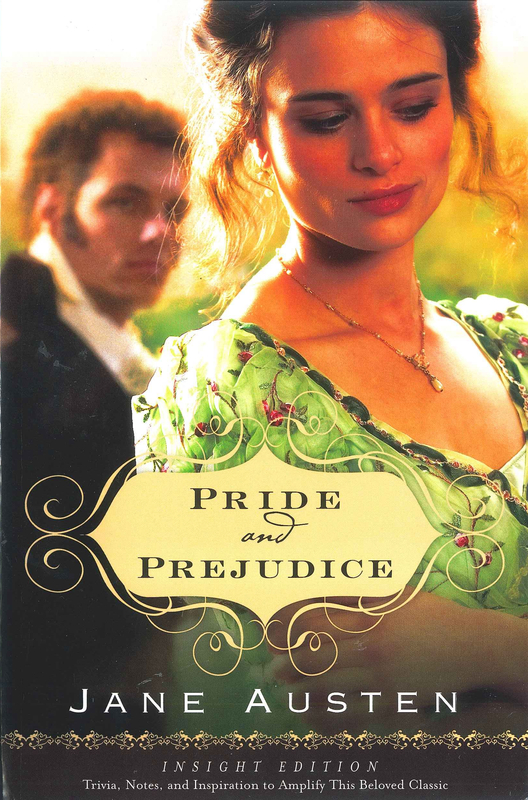 Readers see that this edition of Pride and Prejudice is depicted as a romance because of the impression given by the up-to-date, still photograph as the front cover. The photograph is presumably of a couple, or a man who is perusing a woman he is interested in. The woman in the photo is beautiful but not flashy. She is wearing a nice dress and has her hair and makeup done. The man behind her is dressed up as well, wearing a formal suit. Both of their outfits seem to be a little dated, possibly hinting at the era in which this romance takes place. Curiously, she is looking down and away from the camera and the man behind her, with what could be perceived as a small, pensive smile on her face. It almost looks like she has a secret because of the way she shields herself from the reader and crosses her arms in front of her body. In this subtlety, potential readers are drawn to her and her thoughts. Their body language, positioning, and visual characterization are all trying to get readers to start asking questions about the relationship on the cover before they begin to read about the characters and their relationships within the novel itself. We find out later that the characters on the front are Elizabeth Bennet and Mr. Darcy, and that he is in fact perusing her. Though the scene on the front cover is vague, it can be imagined that this is insight into the relationship that is to come. We learn of Darcy’s feelings first when Austen writes, “Elizabeth had been at Netherfield long enough. She attracted him more than he liked” (Austen 64). Mr. Darcy begins to fall for her intelligence and character quite early, however, Elizabeth refuses his advances as the story goes on. The romance in the text is just as it is depicted in the cover photo; he’s attracted to her, and she is keeping her distance. A quick flip through the pages reveals that the “Insight Edition” includes different add-ins such as romance tips, historical and cultural details, facts from Austen’s personal life, and more. These little additions are cute and do help to enhance the reading but they are definitely reminiscent of books read growing up. They make the older text seem much more exciting and relevant because there’s now direct ways to relate the information to modern life and what readers know. For example, there's a romance rip when Mr. Wickham is introduced in the text that says, "Just because the package looks good on the outside doesn't mean you'll like what's on the inside" (Baker Publishing 76). This not only gets a laugh from the reader, but also provides some foreshadowing into Mr. Wickham's character. Through this romance tip, Mr. Wickham becomes more relatable to the reader, the reader can envision their own personal Mr. Wickham, someone who is attractive on the outside, but lacking some serious internal qualities. There’s also discussion questions in the back, perfect for assigned reading groups in school or book clubs to use. This book is perfect for attempting to make a fun educational reading experience. They gradually ascended for half a mile, and then found themselves at the top of a considerable eminence, where the wood ceased, and the eye was instantly caught by Pemberly House, situated on the opposite side of a valley, into which the road with some abruptness wound. It was a large handsome stone building, standing well on rising ground, and backed by a ridge of woody hills… (Austen 228). Pemberly is breathtaking, especially when all of the grounds can be taken in at once. On the back of this cover, Pemberly is seen from a small distance, enough to keep some mystery but the house itself is still clearly visible. Though in comparison to the photo of Elizabeth and Darcy on the front, Pemberly is quite small, just by placing it on the cover gives it a significance before readers even begin. For it is at Pemberly where Elizabeth finally begins to fall in love with Mr. Darcy. Though the story hasn’t changed, the initial impression from the cover of the book has made it more likely that the readers will focus on the romance within the text and perhaps not the other themes present. The little notes within the text add a playfulness to the reading experience that might not have been picked up without them. This cover is effective at making this version of the book seem fun and interactive; with romantic photograph, fun additions part of the “Insight Edition,” and the invitation on the back.